Pupils with lots to be proud of many of whom illustrated what it really means to have a growth mindset. A belief system that suggests that one’s intelligence can be grown or developed with persistence, effort, and a focus on learning. A belief system that suggests that a person has a predetermined amount of intelligence, skills or talents. Our Proud Assembly for this term began with the choir entertaining us with the two songs they competed with in the Music Festival. “We are the Young” and “Funga Alafia”. It was a wonderful start and we were very happy that the choir went on the next day to receive first place. We then had a ‘first’ for our Proud Assemblies, a returning pupil, Lulu AlSugair (Year 11) who came over from Isa Town to talk about her learning journey in French. She was awarded a Jules Verne French Scholarship last year and described just how difficult she found the learning sometimes, but that she discovered by working hard and not giving up she could be successful. 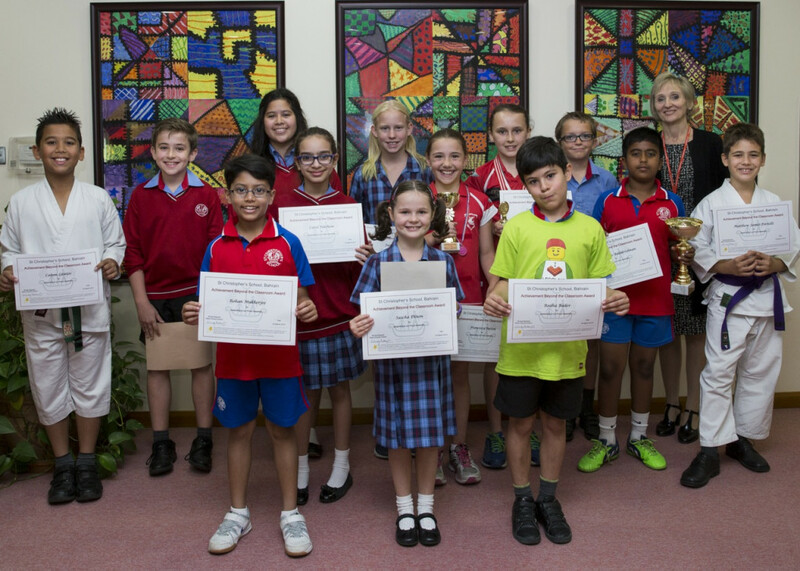 Sascha (3B) and Rohan (3D) represented Year 3 and Sascha shared her super art work and Rohan described his achievement at the Bahrain Tennis Academy, where after trying very hard, he became the 8 years and under tennis champion. He described himself as dedicated and with a real passion for tennis which he said keeps him “happy and healthy”. Still on a sporting theme, Callum and Matthew (4F) demonstrated their karate skills and explained how important they feel the skills of discipline, respect and self-defense that they are learning will be for a healthy and happy future life. Radha (4E) shared a PowerPoint about the pride he takes in his lego-building skills and brought in a selection of his models for everyone to see. Francesca and Carys (5B) shared their love of netball, their favourite positions and lots of different photographs of themselves in action, defending, shooting, passing and marking. It was a super presentation and also outlined the awards and certificates they have won to date. Year 6 stayed with the sporting theme, but specifically swimming and Carol (6D) described her journey from “shivering at the edge” to really “loving swimming” through the SPARTA L2Swim sessions she has attended. “I am extremely proud of myself for what I have achieved and the perseverance I have shown. I can’t believe I have come so far is such a short time. I now believe that if you try your hardest and never give up, you will always improve and enjoy success.” Carol said. She described how she dealt with setbacks and did not allow herself to be discouraged but that now she has reached the point where she swims with some of the top swimmers, she feels much healthier and stronger and is really proud of how far she has come. Our assembly closed with a slide-show Kaleidoscope of design and technology projects that pupils were proud of from across all the year groups, presented by Ben and Zack (6F) and Zoya and Ruchira (6D) with Mr Wilkins also awarding the prizes in the Upcycle and Sustainable Design competition. Well done to everyone who took part, we are really proud of you! Some great examples of a growth mindset!